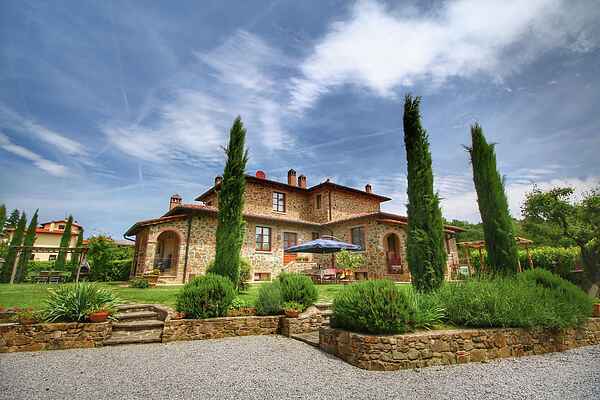 All you can see in the Agriturismo is the result of the work of the Sacchi's family. We have started the activity some years ago, always maintaining the same ideas and methods. In our Agriturismo you have the opportunity to taste our products, to know the original savours of Tuscany. We have two big gardens, one where the Agriturismo stands, and an other not far from here. There, we have our 23 chickens, one goose and 2 ducks, which live free and happy, eating only grass and corn, wheat, soy and some earthworms that they find around. Every day I take about 15 eggs from my hens to make my homemade cakes or my tagliatelle. Olive oil is, together with wine, what makes our region so famous throughout Italy and abroad. It is obtained from the olive tree, native to the Mediterranean basin and our particular variety, called Extra-virgin, is of higher quality, coming just from virgin oil production, it is produced by the use of mechanical means only, with no chemical treatment. Our olive oil is obtained from trees in the fields of “Maestà Rotta\" in Lucignano and “San Poerino\" in Monte San Savino. It is an Extra-virgin oil of excellent quality, that maintains high level of the nutrients of the olive. Ask Claudia for a tasting with some bruschette, in the way it is usually eaten here. We directly produce the honey you find at the Agriturismo, without addition of preservatives, flavorings or coloring. It smells of different flowers in the several varieties, depending on the fields where we put the beehives and the period of the year. In our garden, they are surrounded by the vineyard and the orchard. You cannot miss taking the opportunity to try the match between honey and Tuscan cheese, with the honey complementing the salty nature of cheese, one of the best specialty of our region. You can have it served as tasting in the Agriturismo. Our region is well-known for being one of the most appreciated by tourists from all over the world. The central position of the Agriturismo allows our guests to truly live the beauty of the places all around, which can be easily reached.nn nnSiena: a real jewel of a city, Siena is about 45 kilometers far from Lucignano. The city is mostly known for the Palio, runned every year in August and July, as well as for its historical centre, so romantic for magical walks.nn nnMontepulciano: This little city and the surrounding countryside have fame for the wealth of excellent vineyards from where we can obtain the Vino Nobile di Montepulciano DOCG . Its ancient origins and its nature of City of art are the reasons for its being called “the Pearl of the Renaissance”.n n nPienza: World Heritage Site, Pienza is a small village in southern Tuscany, in the breathtaking Val d' Orcia, World Heritage centre as well. Very close to Montepulciano and Montalcino, where you can find central Italy finest wine, Pienza is the creation of humanist Enea Silvio Piccolomini and due to its strategic position on top of a hill you can admire all the charm of the valley.n n nFirenze: Firenze is popular for its history. Considered the birthplace of the Renaissance and called \"the Athens of the Middle Ages\", Firenze shows all the beauty of its Roman origins, from Ponte Vecchio to Piazza della Signoria. Don’t miss a visit to Piazzale Michelangelo, which has the most famous panoramic view over the city.n nn nnThe Golden TreennThe Golden Tree, also called The Love Tree, is a golden artwork kept in a large glass case in the museum in Lucignano.nnLucignano is a small medieval village in Valdichiana and the sanctuary is a tree, commonly known as the Golden Tree or The Love Tree. It is a golden artwork and it is kept in a large glass case in the museum in Lucignano. According to an ancient tradition, this tree brings happiness to people in love and it's a custom that a bride and groom promise each other eternal fidelity and love at this golden tree.